Joe LeBoeuf is a professor of the practice of management at the Fuqua School of Business, Duke University. Professor LeBoeuf retired as a colonel, US Army, after thirty-four years of uniformed service. His last military assignment was as an Academy Professor at the United States Military Academy at West Point, where he was the Deputy Head of the Behavioral Sciences and Leadership department and Director of the graduate degree-granting program, the Eisenhower Fellowship, a partnership with Columbia University that awards a master’s degree in leadership and counseling to 20+ Army officers every year. His expertise is in leadership education, leader development and organizational culture and change and he has been intimately involved in building the leadership and leader development programs at USMA and throughout the Army. Upon retirement from the Army in 2004, LeBoeuf joined The Fuqua School of Business to teach leadership and management in the Daytime and Executive MBA programs, work in the Coach K Center on Leadership and Ethics (COLE), and serve as faculty advisor to the COLE Leadership Fellows program. His teaching includes courses in Facilitation, Coaching and Mentoring, Leadership, and Leading and Managing Human Capital and Organizational Change. He also teaches in Fuqua’s Educative MBA programs, and in Duke’s Advanced Management Program. LeBoeuf also runs a 4-day leader development experience, Consequential Leadership 2 [C-LEAD 2] for 400+ second-year MBAs in Fuqua’s daytime program. From 2006-2010 he taught an undergraduate course in Military Leadership in the Hart Leadership Program, Sanford School of Public Policy, Duke. He was promoted to Full Professor of the Practice of Management in the spring, 2006. Outside of his Fuqua responsibilities, he serves as a member of the learning network with Duke Corporate Education. He participated as a consultant on several significant studies to include the Air Force Academy’s leader and character development program and an in-depth review of the leadership and leader development curriculum of the Army’s ROTC programs. He has served as a program integrator and educator with the Center for the Army Professional Ethic [CAPE] on an Army-wide project to re-professionalize the Army’s culture under a contract with Praevius, Inc. He is currently working in leadership education and developmental programs for the US Army Special Forces, Ft. Bragg, NC. LeBoeuf also serves as a member of the Board of Directors of Leadership Triangle, working on their leadership programming, and is the President of the West Point Society of the Triangle. LeBoeuf has been a contributing author in a number of books and other publications for the United States Military Academy and the U.S. Army to include FM 6-22, Army Leadership, and the U.S. Army’s Concept for Officership, and a chapter in the book, Future of the Army Profession (McGraw-Hill, 2003). He also served as an editor for the book, The Lieutenants Tour, a handbook on leadership written for Army lieutenants. His research and writings have also appeared in Military Review, The Teaching of Sociology, the Handbook for Teaching Leadership, Leader to Leader, and the Journal of Consulting Psychology. 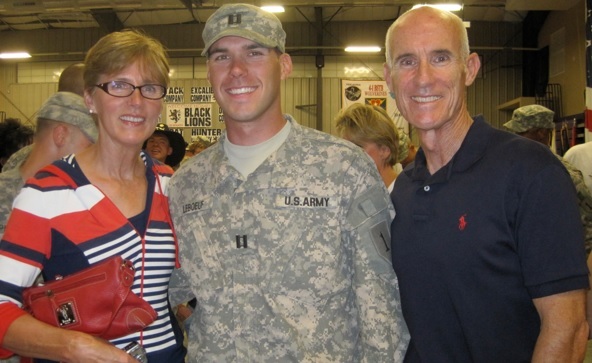 He has been married for 33 years to Brigadier General, Retired, Maureen LeBoeuf, formerly the Head of the Department of Physical Education at West Point, and Executive Director of the Feagin Leadership Program, Duke. She serves on the NC USO board, and is an educator and leadership consultant with the Thayer Leadership Development Group at West Point, NY. Their son Jay is an Army CPT, USMA graduate, combat veteran, currently serving in a Special Operations unit at Ft. Meade, MD. Daughter Jackie married her high school sweetheart Stephen Thorn, a US Naval Academy graduate, now a US Marine Infantry officer with the 1st Bn, 3rd Marine, Oahu, Hawaii. Jackie is a culinary institute graduate, and certified pastry chef, working in a boutique bakery in Honolulu. 30 years ago, I literally crashed into my firm persuasion, my true passion, during my first tour as a member of the faculty at the United States Military Academy at West Point. I developed a love for teaching and leadership development; investing myself in others. And, I discovered that I was also very good at it. Not sure anyone can really lay claim to being the best at most things; others provide that label. I fundamentally care about others, and see my legacy through an effort to help others be their best selves. My 34 years in the military taught me the power of WE over I, and I work hard to be a good member of the communities I serve, placing the needs of others and the community over self. This is how I see my legacy; working outside myself in a quiet, steady way. I work hard to ‘work-harder’ than anyone else at what I do. I consider myself an ordinary person, who works hard to live an extraordinary life. Hard work, persistence and GRIT are key. And, I am not afraid of leveraging what others have done if it helps me to be better. Good ideas do not have to start with me. Personal: I believe that being happy and having fun are not goals in life but the outcomes of pursuing your purpose and firm persuasion, seeking ways to make a difference, and matter in the lives of others. When you are working inside your passion; happiness follows. As I am on the downside of my life, I want to continue to try and find ways to matter, make a difference, and make the world a little better. Business: Not really a businessperson per say; have no current aspirations to own, run or be in one. Not motivated by a P and L, but by the nature of the work I chose. I am motivated in the work I have chosen to help those in business to be good leaders who achieve good consequences, and for whom character and integrity mean as much if not more than competence, and who work hard to create the conditions for others to be their best selves and make a contribution in some significant and meaningful way. My ‘ADHD’ self tends to be all over the map with things that capture my attention and interest. As a psychologist/behavioral scientist, the wide range of behaviors associated with the human condition fascinates me. Frankly, just trying to understand why people do what they do fills up most of my intellectual space these days. I am constantly looking for ways to unlock human potential. My family, particularly my spouse and my children are my favorite by far; being around them makes me smile. As a retired US Army officer, soldier, I love being around American soldiers, and continuously look for ways to be in their good company. Being around people who care more about others than self is humbling and energizing. My backyard, early in the evening by the pond and waterfall with my oldest son, an Army captain, with a glass of good bourbon or scotch and a cigar. French Quarter Inn, near the market in Charleston, SC. An elegant watch; love the skill, craftsmanship and commitment to excellence required to build a world-class timepiece.